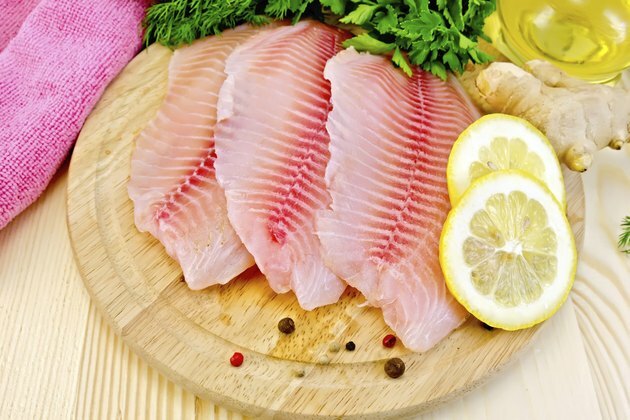 Boiling is a good way to cook tilapia fillets quickly and season the fish without overwhelming its natural flavor. The term “boiling,” however, is something of a misstatement. Although you do bring the cooking liquid to a boil, or a temperature of 212 degrees Fahrenheit before adding the fillets, the fish actually cooks at a point below boiling, usually between 160 to 200 degrees Fahrenheit. Regardless of the temperature, cooking tilapia in this manner takes only about 20 minutes from start to finish. Rinse the tilapia fillets under cold running water and pat them dry with paper towels. Sprinkle about 1/8 tsp. per fillet of seafood seasoning and/or black pepper, using an equal amount on each side of the fish. Add 1 cup of cooking liquid per tilapia fillet and the vegetables to a large saute pan or skillet. This can include water, low sodium chicken or vegetable broth, white wine or a combination of liquids. Bring the liquid to a full boil on your stove over high heat. Add the tilapia fillets, using a spatula to slide the fillets into the liquid. Bring the liquid back to a full boil and then reduce heat to medium. Cook the fillets for eight to 10 minutes. Monitor the liquid closely during this time to ensure the liquid does not return to a boil. Reduce the heat slightly if you see anything more than a few slow, gently bubbles rising from the liquid. Transfer the tilapia from the liquid to a serving platter using a spatula. Discard the vegetables and cooking liquid. At 2.5 g of fat per 4 oz. serving, tilapia is a slightly fatty fish. Choose additional ingredients, especially liquids that do not increase its fat concentration even further.